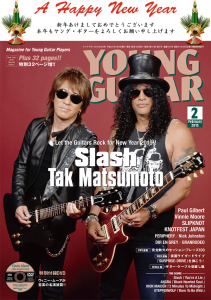 The February 2015 issue (released January 10th) of Young Guitar magazine features Tak Matsumoto and Slash together in the cover story and this is our write-up. 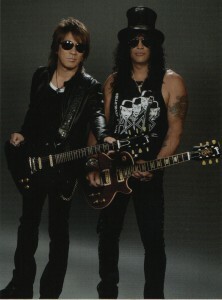 The article begins by explaining that Tak and Slash have a lot in common: They have their own Gibson Signature Models, they have each won a Grammy Award, they’ve both released a slew of #1 albums—so it was about time that the two sat down for a proper talk. As it turns out, they have even more in common! The interview starts off by asking the two when they started playing the guitar, and what the first song was they tried to learn to play. Slash started out when he was 14 or 15. And so was, in fact, Tak Matsumoto. He started playing the guitar when he was 15 years old. They both started out playing “Smoke On The Water” by Deep Purple. However, Tak goes on to explain the Japanese music scene at the time: There weren’t a lot of (hard) rock bands in Japan at the time. Everyone was listening to the international bands, such as Deep Purple or Led Zeppelin. Tak also wasn’t able to see them live as these bands wouldn’t tour a lot in Japan in the 70s, so he only knew them from magazines. Both of them then went on to talk about their early days of guitar playing, such as the times when Van Halen came out with his album “Van Halen” in 1978. Everybody wanted to copy Van Halen and his playing style. However, Tak and Slash were different. While they admired his guitar playing style, they both recognized his skill as such, but went on to stick to their personal style instead of copying Van Halen. Before founding B’z, Tak worked as a session musician for seven years. He goes on to say that it was a very hard time for him, especially since he couldn’t read musical scores. Furthermore, as time in a studio is valuable, musicians are expected to produce 100% right away. So sometimes Tak’s performance wasn’t satisfying such that he was told to go home by getting told “Guitarist, thanks, that’s it for today”. Slash showed sympathy as he had a similar experience. He added that if being able to read musical scores was a requirement, he probably would’ve been fired right away. After having talked about their early days as guitarists, they moved on to talk about their respective bands. Slash has worked with Guns n Roses’ Axl Rose, and now Miles Kennedy. Tak has worked with Koshi Inaba. 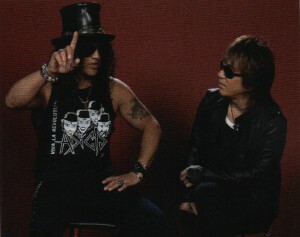 The interviewer asked Slash and Tak, what the band’s vocalist/singer is to them. “I think the most difficult thing when founding a band is to find a singer”, Slash says. “Axl was the first singer I met where I thought he had actual talent.”, he added. “And I think singing is a much harder job than just playing an instrument”. Tak chimed in “Yeah, singers are really something else. (laughs)”. Slash then went on to say that a singer has to be in front of the audience, making eye contact, and deliver a message to the audience through their singing. Tak and Slash both agreed that such a task would be impossible for them. Tak was also asked what it is like to work with Koshi, but the interviewer noted, that it might be a difficult question to answer since they’ve been working closely for a long time. “Koshi is very easy to work with”, Tak says, “…I think there’s no other way to say it”. He continues: “He’s the only singer I have really worked with, so I don’t know what other singers are like. But the fact that we’ve been able to work together for so long is really that he’s easy to work with.” Furthermore, Tak stresses the fact that they both talk about everything. He may be the leader of the band, but he does not ignore Koshi’s opinion. Also for him, Koshi is the best singer there is. As Tak Matsumoto (53) and Slash (49) aren’t exactly getting younger, they were asked if they’d like to work on a technical album, showing off different guitar techniques and styles. It is said that with age, it gets harder to play the guitar. Slash says that he can totally understand that train of thought. After all, you should do such an album before your technique starts to get worse due to your age. But then he talks about how BB King is still playing, and he’s 89 years old and still doing awesome performances. “I think with age, your playing and tone gets a certain depth which you didn’t have in your young years. Also, I really want to learn more and more about music.”, Tak adds. 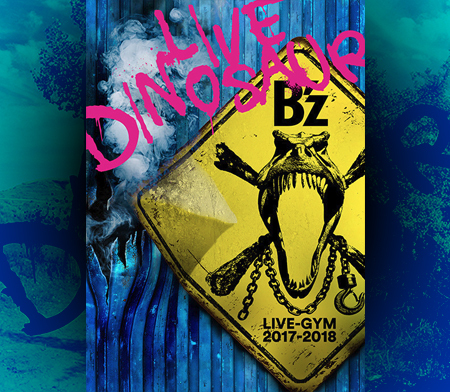 After having talked briefly about their Gibson Signature Models, they finished the interview by announcing their future plans: B’z is going to release a new single 「Uchouten」 on January 14th, while Slash is going to tour Japan in February. Thanks for the translation. 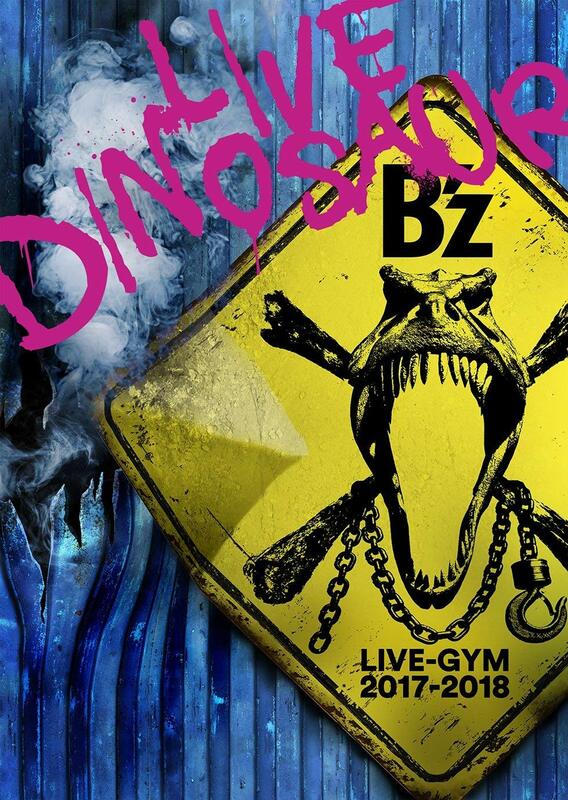 Guys, I do remember there was an interview of Takashi Utsunomiya (TM network) about B’z. I wonder if it was one of keen’s translations. The only thing I remember about that interview – TU said: ‘Matsumoto used to be a weak profile”. Does anybody know where I can find the translatrion of that interview? Thanks for the continuous information guys! I just love it when 2 huge figures sit together and talk about this and that. Very interesting. Nevertheless, allow me to state that Guns N’ Roses front-man is Axl Rose and not Axel Rose. Thanks for spotting the typo! I didn’t notice! Ah great article. Thanks a lot for all the hard work! Haha reading music scores (hides in a corner until the scores are gone)… I knew that about Slash but Tak. Wow! A collaboration album would be great. I wonder what it would some like.